Mythical bird known as hōō in Japan. The Islamic tradition appropriated the far-eastern iconography of the phoenix and used it to represent another mythical bird, the simurgh. The piece is carved in archaistic style. The yellowish-beige jade has some darker patches. 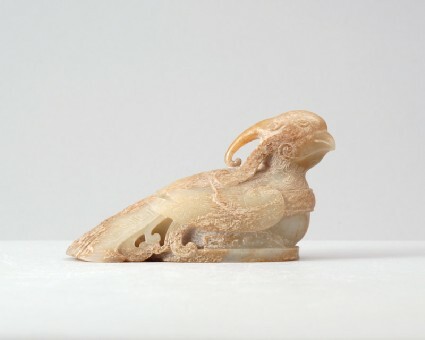 The solidly carved bird is shown reclining on an oval plinth, with pointed beak, small ears, a long curling crest and long feathers protruding from its cheeks. The wings are raised in relief and joined in front by a flat strap across the neck. A long fan-shaped tail with curling feathers protrudes from under the wings, and angular scroll motifs are replacing the legs. Stylized feathers are engraved at the neck and tail, but the other parts are decorated with abstract key-fret and archaistic scroll motifs. The flat plinth is plain.